I recently discovered a blog for Gluten-free and Dairy-free dining in Disney World in Orlando. They share food reviews, restaurant reviews as well as tips to dining gluten-free and dairy-free at Disney. 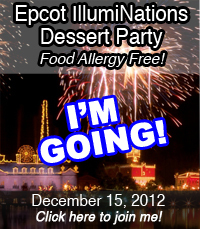 They are putting on a Private IllumiNations Dessert Party December 15th at Epcot. It sounds really fun! Tix are $50 and the event includes items free of gluten/wheat, dairy/milk/casein, soy, egg, peanut, tree nut, corn, fish and shellfish. A variety of delicious desserts free of the top common allergens will be served. Makes me want to do something like this in Jacksonville… In the meantime, who wants to join me? Disney is the BEST for GF eating. Make certain you ask for the chef at the park or hotel restaurant. Last time we were at the Turf Club at Saratoga Springs, Glen, the chef was explaining the dishes to us and he suddenly asked if we wanted GF crab cakes. Absolutely! I don’t have to eat GF but always do at Disney because the sauces are reduction sauces and delicious.